for the 'Inspired by Stamping' June Sneak Peeks! Here we go with a new set of colors from The Play Date Cafe! This time 'round, it's Aquamarine, Poolside and Clay. 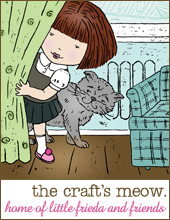 And we have The Craft's Meow as our sponsor this week -- love their stamps! Since I have some adorable TCM stamps, I used those for my project. I just have to say, my card took waaaaay too many hours to conjure up. Once I got the idea in my head, somehow the translation to paper just didn't quite make it the way it looked in my mind. Ever have those times? The beach ball looks so summery, sitting among those sandy mounds. One lucky player this week will receive a special prize from The Craft's Meow. For all the details, head over to The Play Date Cafe. Oh my word! This is adorable Colleen! I wonder how more adorable did it look in your head cuz this my friend is absafreakinlutely adorable!I love the perfect sand, the beautiful waves and the oh so cute stamps. Very adorable, i feel so refreshing after seeing this.. it's very cool. Oh my gosh, this is an AWESOME looking card. I just pulled up the PDCC blog and this one really caught my eye. Love the blue and brown against all the white, the dimension on the images, the twine...well, everything! FUN card! Super cute summer tag Colleen!! Love these cute images and the scene you created with the sand and the stamped waves! darling card! So fun that TCM gets to play with the PDCC! How fun, perfect for the season! I echo what Amy said above - a great pairing: PDCC and the Craft's Meow! AMMMMMMMMMMMAZING! I love that sand! LOVE the twine and that whale...guess I LOVE it all:) You nailed this color story! HUGS! SUPER DUPER cute card Colleen! Love the fun beach ball nestled in the sand. I think this is really cute and Summery! I know what you mean about designs not turning out on paper like they are in our mind. Happens around here all the time. Sometimes it works better to just go with the flow and not think too much ahead of time. That happens to me all the time. I picture something in my head and it doesn't come out how I had image. I have to say your card is just as cute as can be..
HOW LOVELY!! I like the stamps and the details specially the beach ball, so COOL!! Well, the hours paid off, Col, because this is ever so sweet! LOVE the horizontal layers! Love this one to pieces. Oh, I have those times, alright! I have to say, though, your finished product is mighty cute! 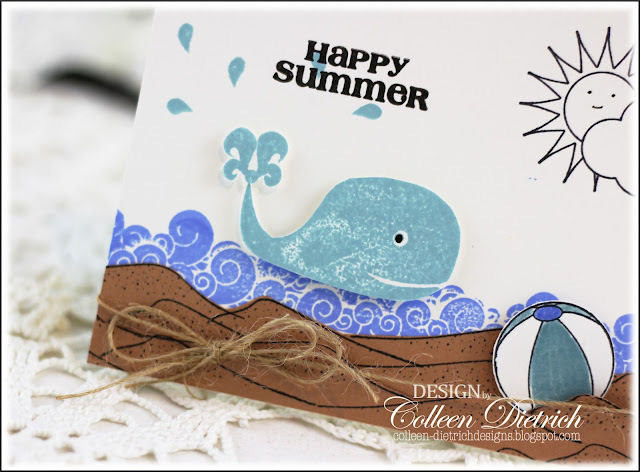 A lovely fun summer card, Colleen! Love the waves, sand, and adorable whale! Great job...love it! Have a wonderful weekend, take care! 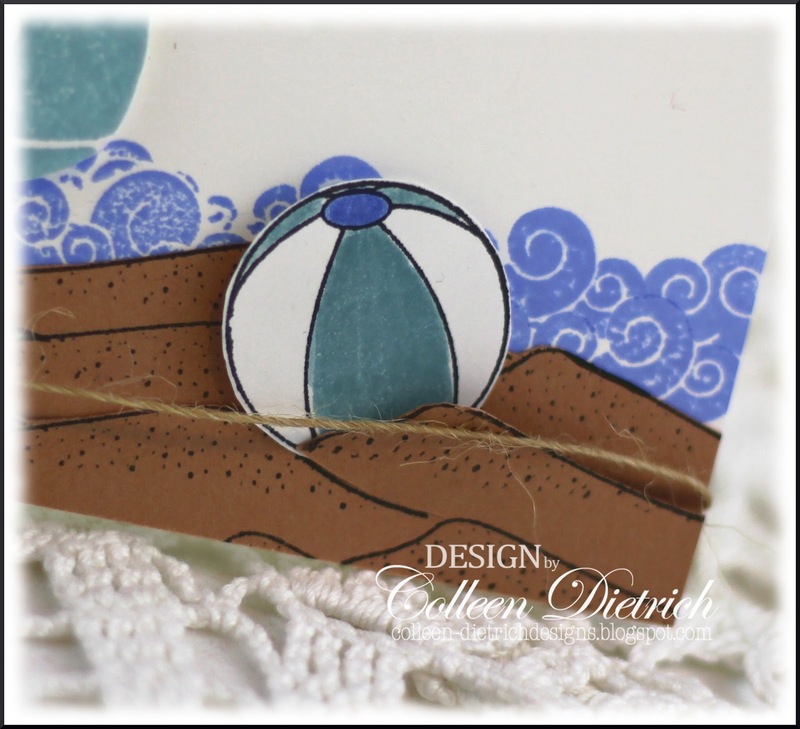 Excellent summer card, loving it...makes me want to go somewhere warm and hang on the beach! Great job with those colors and those stamps...they're perfect together!